First I need to say that this is not an official Girl Scout blog; I am just a person with her own opinion and feelings and thoughts about current events. One of the things I love about Girl Scouts as an organization is that they believe in, encourage, and practice, radical inclusion. That means that Girl Scouts is meant to be available to *every* girl, and every family. Where there is an obstacle facing a girl, Girl Scouts will do what they can to work around it, conquer it, or smash it. When Girl Scouts was one of the first organizations to take a stand on behalf of transgendered children; I was incredibly proud. But the Girl Scout legacy of inclusion goes back much further. Insert your favorite defense of the Confederate Flag here. These comments were all made shortly after the horrifying events in Charlottesville, VA, where Nazis and racists joined forces to terrorize a community and our country as a whole. Where Nazis walked proudly in our streets terrorizing and demonizing people of color, immigrants, Jews, LGBTQ people, and more. Nazis. Actual NAZIS. Doing the Heil Hitler salute and more. Murdering an innocent protester. We don’t get to choose the time we live in. We do get to choose how we respond to that time and the circumstances of that time. If you ever wondered what type of person you would have been when Martin Luther King Jr. was leading his peaceful protests, or what you would have done when your Jewish friends were being rounded up into ghettos, when they were forced to wear yellow stars and finally when they started disappearing, or what you would have done when screaming crowds terrorized little girls just trying to go to school? If you have ever wondered those things without having been alive then, you get to find out now. You get to choose now, what kind of person you want to be. Which side of history you will want to be on. You have a gift in that you have seen these battles play out before in America. You’ve seen how they turned out before. I believe in our country, and I believe there is a forgone conclusion in this fight. We have already fought these wars and told the world where we stand. We all know how this ends. It’s going to take an army of love and kindness to conquer this much hate. It won’t be pretty or polite all the time, it can’t be. Being quiet and polite is what has let it fester and grow in our midst. 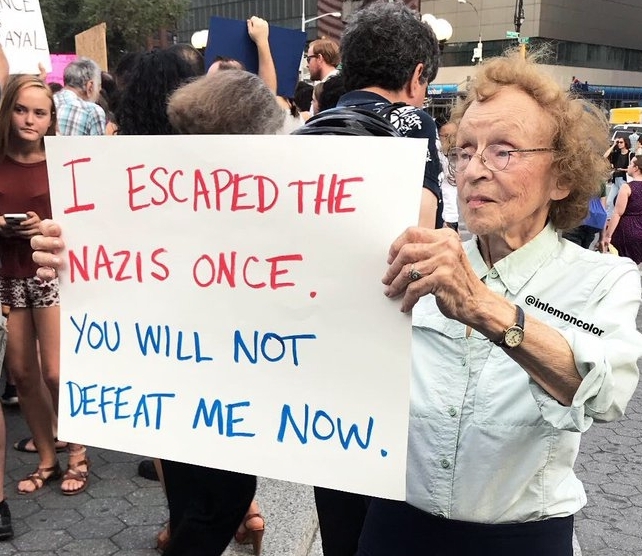 Nazis and racists are not free to terrorize people. That is not what free speech is for. I don’t know if I can make anyone think by writing this post. I am sure some will read this and be angry. I hope if you are angry, you sit with it and think about *why* you are angry. I hope that I can make one person think about how to be kind and include, instead of taking a stand on behalf of hate and exclusion. And I know that I have to try, and I have to not give up. I can’t BE in this organization founded on an idea of radical inclusion and not say these things, not feel these things, not be these things. There is no scrap of fabric that would conquer my desire to ensure that girls and their families feel welcome in my troop and my home and everywhere we go together. 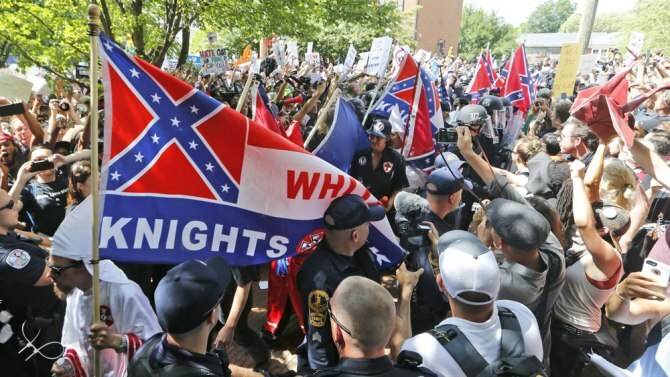 If I were the descendant of someone who fought in that horrific “Civil” war, that war that killed more Americans than all our other wars combined, that war of blood spilled for the right to OWN OTHER HUMANS, that shame of our nation; if I were, I would certainly not be displaying that flag with pride. 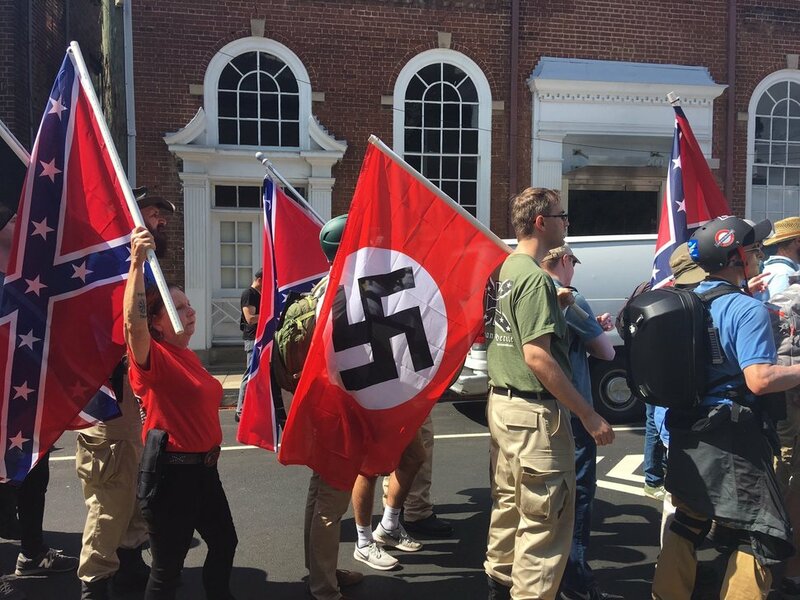 Anymore than the descendants of Nazis would display the Nazi flag with pride. 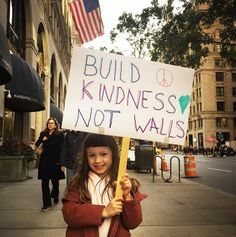 Let’s think, let’s strive, let’s march onward and INCLUDE and be kind and teach our Girl Scouts to do the same, and that army of love and kindness and inclusion will march on and change the world for the better.